In the fall of 1862 Julia Wilbur left her family’s farm near Rochester, New York, and boarded a train to Washington DC. As an ardent abolitionist, the forty‑seven‑year‑old Wilbur left a sad but stable life, headed toward the chaos of the Civil War, and spent most of the next several years in Alexandria devising ways to aid recently escaped slaves and hospitalized Union soldiers. A Civil Life in an Uncivil Time shapes Wilbur’s diaries and other primary sources into a historical narrative sending the reader back 150 years to understand a woman who was alternately brave, self‑pitying, foresighted, petty—and all too human. 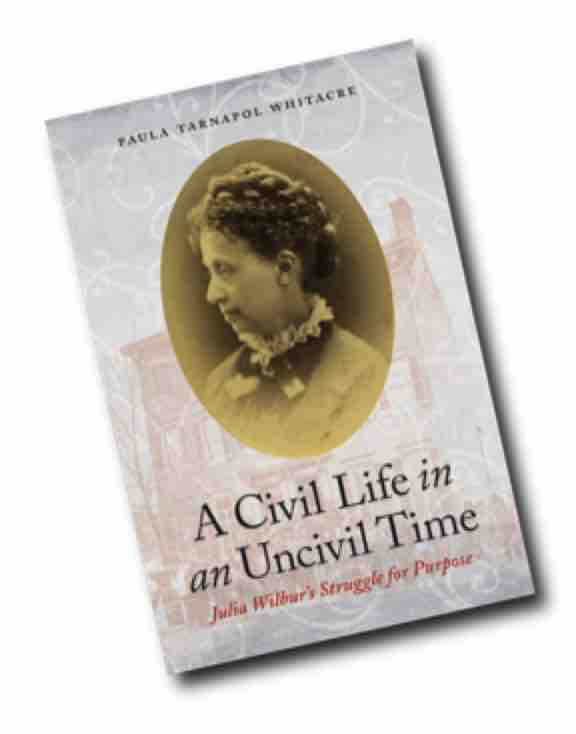 Whitacre describes Wilbur’s experiences against the backdrop of Alexandria, Virginia, a southern town held by the Union from 1861 to 1865; of Washington DC, where Wilbur became active in the women’s suffrage movement and lived until her death in 1895; and of Rochester, New York, a hotbed of social reform and home to Wilbur’s acquaintances Frederick Douglass and Susan B. Anthony. In this second chapter of her life, Wilbur persisted in two things: improving conditions for African Americans who had escaped from slavery and creating a meaningful life for herself. A Civil Life in an Uncivil Time is the captivating story of a woman who remade herself at midlife during a period of massive social upheaval and change. In transcribing the diaries and researching their many references to events and people, I came across many pieces of history that I could not fit into the book. I share this information in my blog, on a walking tour in Old Town Alexandria, and at readings.